Progeny Press offers literature study guides from a Christian perspective, for books that aren't specifically Christian in nature. 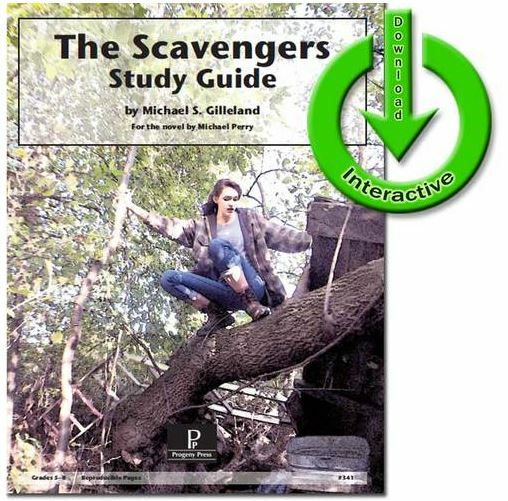 We chose to review The Scavengers eguide. I wedged my fists on my hips and I announced that Maggie was yesterday, and from this day forward I would answer only to Ford Falcon. When the world fell apart, most people moved into the Bubble Cities. After her parents chose to live OutBubble, Maggie decided it was time to grow up and grow tough. She renamed herself Ford Falcon, and she spends her days scavenging in a junkyard while fending off occasional attacks from solar bears and GreyDevils. Although times are hard, Ford's family has been making do. But when she returns from a bartering trip to find her home ransacked and her family gone, Ford must prove she is brave enough to face this wild world alone and overcome whatever obstacles stand in the way of rescuing her loved ones. " The Eguide is recommended for grades 5th through 8th. I like the flexibility the guides give me in teaching my daughter. She is a big reader, much more than her brothers. With homeschooling 4 children now, I need to juggle who I am spending time with, and often that time gets scheduled with the toddler or helping with math problems. The Progeny Press Guides give my daughter an opportunity to work solo on her reading and comprehension, plus enjoy it while she is doing it! She would work on one section per week. This will get her done with the study in eight to ten weeks. It is recommended to read the entire novel first before doing the study. We read it as she would do the study instead and it seemed to work out fine for her. It was probably a little easier for her to remember what she read when she would read a few chapters and the work on the assignments for the week. Each Progeny Press guide has some pre reading activities that can get the student excited for the book. These can mostly be done off line and even with siblings. The lessons begin with a vocabulary study. This eguide is interactive so you won't have to print out all of the pages. There are answer options for each of the vocabulary and the student can utilize it right from the computer. It is a good thing we got another computer for the upcoming school year, as it seems more and more products are becoming geared for the computer. Thinking about the story is the next section in the lesson. Here not only are they answering questions about the story, but looking at key literature and grammar terms . The Digging Deeper section is typically done at the end of the week. This gives the student an opportunity to dig deeper into some of the topics read, and compare them to some Bible text. This is a great feature in Progeny Press, is that it is Bible based. You can get any sort of literature guide to help kids understand their reading. To get them to see things through a Biblical worldview though, you will want to use Progeny Press. There are a couple optional activities at the end of each lesson. If you want to draw the study out and make it longer, these are great rabbit trails to follow. Because we were working through this during summer break we opted out of the optional ideas this time around. I think we will be sure to work on some of those in future studies however. They do look like well thought out, and fun projects to learn about. Progeny Press has study guides for all age groups. The guides are much the same for each piece of literature. Great for independent study, but also would work well for a read aloud for a group of students. Be sure to check out their variety of books as you plan this coming falls line up. You can also get a printed hard copy of this study or purchase it on a disc. Find Progeny Press on these social media sites.